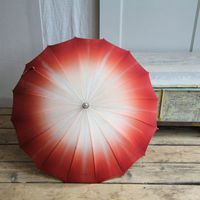 First recorded in Ancient China, umbrellas or parasols have been used the world over, in countless styles and materials. Whether used to keep off the rain, or stay out of the sun, the umbrella is one of the most important and functional pieces of anyone’s wardrobe. Yet practicality need not be drab or unstylish, as demonstrated by cute see-though or kawaii models. Whether we decide to go vintage or modern, umbrellas are also a great way to accessorize! Matching look, fabric, and pattern with the rest of a fashionista’s outfit can create a style that is elegant, gothic, or cute!